Well, it looks like the developer meetup over at Twitter is underway, and information is making its way out over Twitter about it. It sounds like the company is unveiling some new Twitter Card types, which are its way of displaying embedded content within tweets, and it’s all about mobile apps. Developers have long wanted more access to this prime real estate, which could turn Twitter into a valuable resource to sell goods, digital music or anything in between. Sadly, press wasn’t invited to tonight’s gathering, but the tweets are flying. AllThingsD had originally reported last week that this was going to be what we’d see. Super excited for Twitter’s new Cards features. Should make all sorts of new experiences possible. One of the most important features in the new Cards is the ability to allow users to download your app (if the user doesn’t already have it installed), or deep-link into your own app (if the app is already installed on the user’s mobile device). The ability to enable app installs and deep-linking is globally available across all Twitter Card types – you’ll just need to add a new set of markup tags as detailed below. If a user does have the application installed, you can specify a deep-link into the correlated resource within your own application. 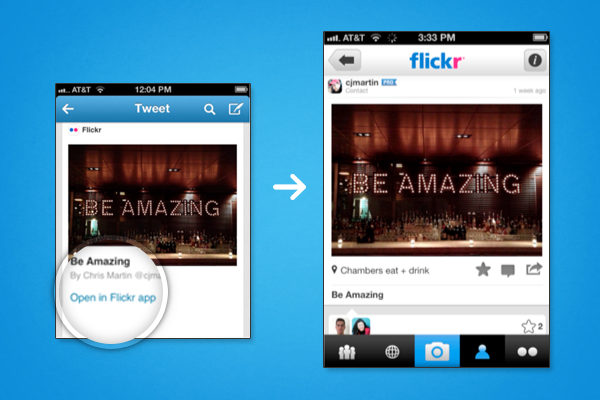 When a user clicks on the “Open in app” tap target, Twitter will send that user out into your application. This value is specified in the “twitter:app:name:(iphone|ipad|googleplay)” tags. The app url should be your app-specific URL Scheme (requires registration within your app) that launches your app on the appropriate client. Of course, all of these new Card types will keep users within Twitter more and will build a better relationship with app developers, including tracking engagement analytics closely for companies. At least we know they can track crash reports for them. In addition to analytics, Twitter will now bring in more revenue for promoted tweets, as app developers will immediately see Twitter as a way to drive installs. 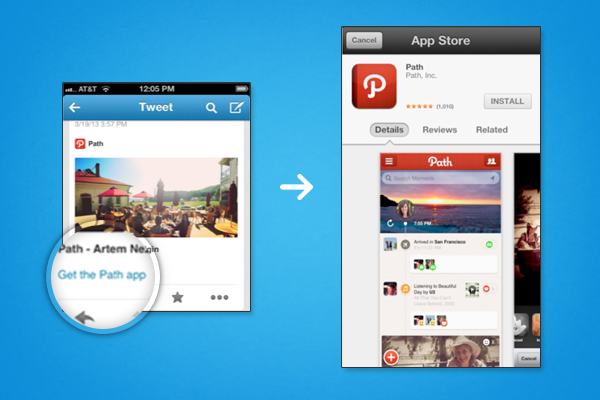 It makes complete sense and Path seems super excited about it.